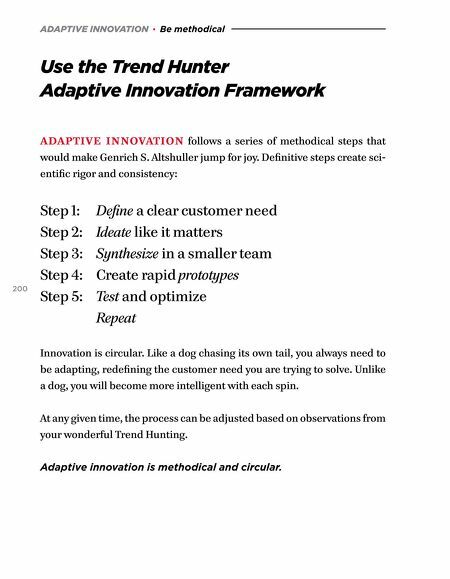 ADAPTIVE INNOVATION · Be methodical Use the Trend Hunter Adaptive Innovation Framework ADAPTIVE INNOVATION follows a series of methodical steps that would make Genrich S. Altshuller jump for joy. Definitive steps create sci- entific rigor and consistency: 200 Step 1: Define a clear customer need Step 2: Ideate like it matters Step 3: Synthesize in a smaller team Step 4: Create rapid prototypes Step 5: Test and optimize Repeat Innovation is circular. Like a dog chasing its own tail, you always need to be adapting, redefining the customer need you are trying to solve. Unlike a dog, you will become more intelligent with each spin. At any given time, the process can be adjusted based on observations from your wonderful Trend Hunting. 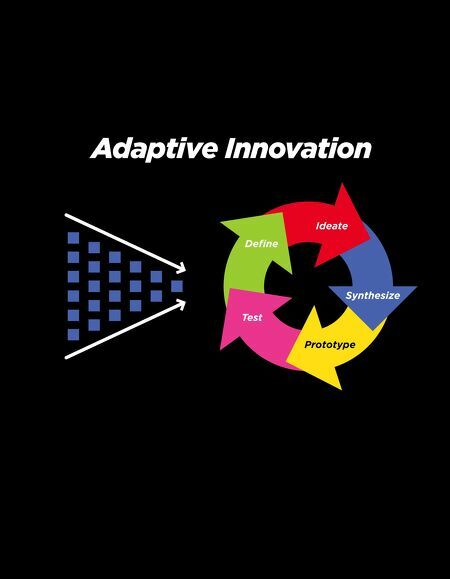 Adaptive innovation is methodical and circular.